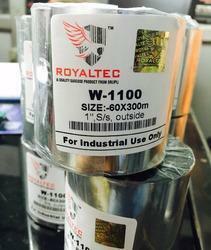 We are glad to inform that our company has Launched a new Trademark (TM) "ROYALTEC" with an eagle logo, Which will be considered as our Brand in all our present and future manufactured & Trade products. RoyalTec Branded Barcode Ribbons is designed to maximize your up time while producing sharp, crisp print and clean edge definition for all printers. We offer our clients with barcode ribbons in various colors, thickness and others. This range of products is designed using finest quality raw material, procured from reliable sources of the market. Material: Wax W-1100 / Wax Resin WR-1100/ Resin R-1100/ Permanent NK-1100 / Nearedge / Washcare. Diameter: 1 inch, 1.5 inhc. 1/2 inch. Ribbon Length - It is desirable to use the longest ribbon your printer will accept so that you have to re-load less. Each printer has a recommended ribbon length, however, if you are not sure which length it is, we can suggest the proper ribbon for your printer. Wax Ribbons - Most widely used for shipping, distribution and product identification labels. Different formulations are available depending on specific requirements. Wax ribbons are formulated in general purpose and low melting point for high speed printing. - Good life & for general purpose. - Light contact during handling & melting point - 68oC. Wax-Resin Ribbons - For labels which require increased scratch and smudge resistance. When used in combination with synthetic label stock, this ribbon will produce a label that is resistant to moisture and ultra-violet light. This type of label can stand up to exposure to rain, sun and cold. We provide wax-resin ribbons for flat head and near edge printers as well as in line printers. - Premium wax resin & proven quality. - Improved image durability & melting point- 80oC. - Withstands multiple scans, rough handling, outdoor elements. Resin Ribbons - Most scratch and smudge resistant. Ideal for applications that require images to stand up to continuous use in factories and distribution centers. Certain formulations are steam press resistant and others are washable and dry-cleanable, used for Labeling. - Maximum durability for harsh environment labelling. 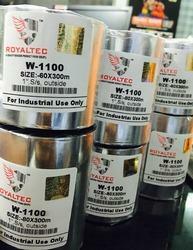 - Extreme environments & melting points - 110oC. - Chemical, alcohol & heat exposure.